Happy New Year lovely readers and thank you so much for sticking with me the last few months while things have been sparse around these parts. I'm hoping to remedy that in 2014. It's all about finding a sense of balance. My goal is to find some sort of balance that works for me. Let's face it, it's impossible to do it all. I've tried and fallen flat on my face, miserably. Time and time again. It's time to pick myself up, dust myself off and keep moving forward. Will things be perfect? Of course not! Here's the big change though - I'm ok with that. I don't need or want to be "super woman". I don't have to have the perfect house, the perfect after school activities, the perfect (insert your answer here).... I just have to be happy! That's been missing in my life folks. I've been stressed, overwhelmed, feeling inadequate, tired - everything except just plain old happy the past 6 months. Why? Why accept that? I don't have to. It's been self imposed really. Yes, to be completely honest - I have done it to myself. How awful is that? I know many of you do the same thing. Why do we do that? Why do we put all this pressure on ourselves to be "perfect". It's unrealistic. 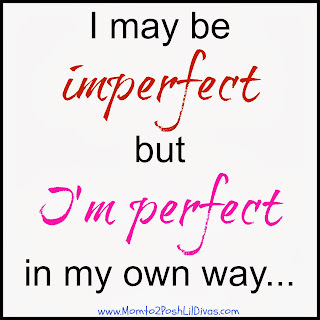 Let's face it, no one is perfect. Those mom's you secretly envy who look like they have it all together and have the "perfect" life - they don't. No one has a "perfect" life but we can make our life perfect for us. It will be flawed, imperfect and sometimes contain failures but it will be ours. We can pick ourselves up and learn from the mistakes (not beat ourselves up for them) and move forward. We can focus on what it truly important to us and know that it's ok to let some things fall to the wayside sometimes. The world won't come to an end if our children have cereal for dinner, if we don't have time for a bedtime story or if the laundry has to wait another day or two. I promise you it won't. I know from experience. I've done all those things and we are still here, still standing strong. My girls didn't say, "what a bad mom giving us cereal for dinner". The actually cheered and thought it was cool. We have since embraced breakfast for dinner around here every now and then, even my husband. They get it. They know sometimes I have too much on my plate and they were able to adjust. I love them so much it makes my heart full to bursting. Here's a BIG one - It's ok to say 'NO!". That's huge for me. It probably is for you too. Why do we feel like we must say yes to everything? If we honestly can't do it - why don't we just say so. Why stretch yourself thin and then feel miserable, stressed and overwhelmed. Who benefits from that? Certainly not me or my family and in the end no one else around us does either. Yet, I have always been a "yes" girl. Never wanting to admit that I can't do it all. Never wanting to let people down. Once again putting unnecessary pressure on myself. Pressure no one else even knew about because I kept it all to myself. I didn't want to show my cracks, my flaws. It gets harder and harder to hide them. I'm done hiding them. It's ok to say, "I have a lot on my plate and I really can't commit to doing anything else today" or "I can't do that today but I can help you (insert day) if you can wait". They will understand and if they don't - too bad. I'm done putting everyone else ahead of myself and my family. I matter. It's ok to ask for help. Another hard one for me. Why - asking for help means admitting I can't do it all. Yikes! What will people think of me when they find out I don't have it all together? It's simple really - they will think I am human. I am just like them. When we reach out for help we get so much more that just help. We find acceptance, camaraderie and allies. When I've put down pretenses and let people see my cracks and flaws, they were willing to share theirs. It feels so good to know you are not alone. Don't let the pretense of being "super woman" isolate you. Being a working mom and wife is hard enough. I need my allies, my friends and my family. Think about it - even super heroes have trusty side kicks. So, this year I am going to focus on finding a form of balance that works for me. It won't be perfect, and I'm sure I'll fail at it at times and (gasp!) even lose sight of my goal and revert back to my old ways every now and then because let's face it - old habits die hard. I'm hoping that in those moments my mind will focus on this one word - BALANCE. I'm hoping that by choosing to embrace it this year it will act as my reminder, my beacon so to speak, and lead me back on my path because I matter. So do you. 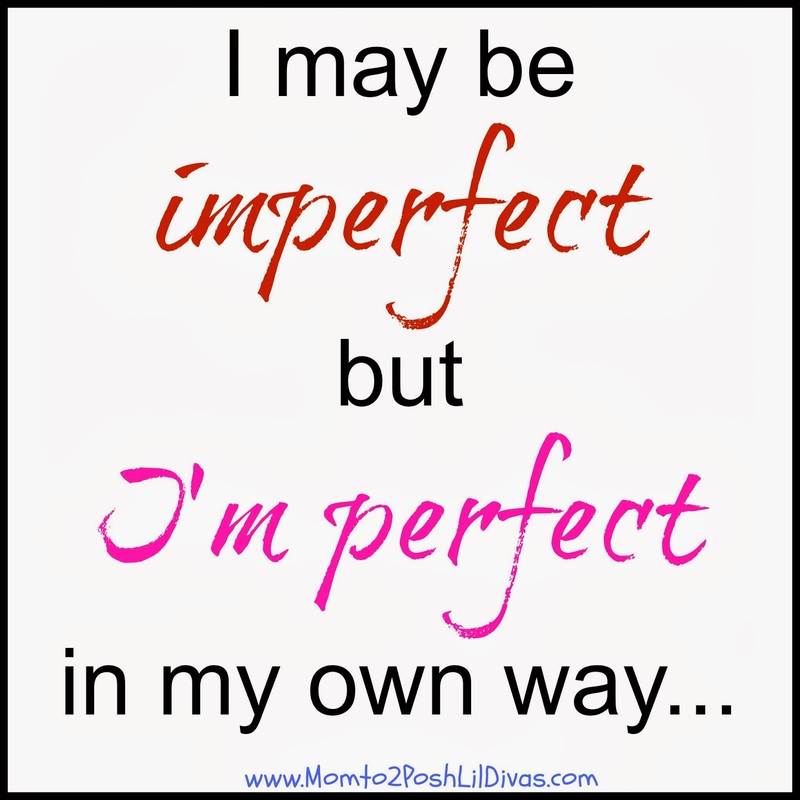 I may be imperfect and fall short of the mark sometimes. That's ok. What matters is that I do "my" best. My best may not be your best. That's ok. It's good enough for me and my family. They love me for who I am, not who I think I am supposed to be for them. 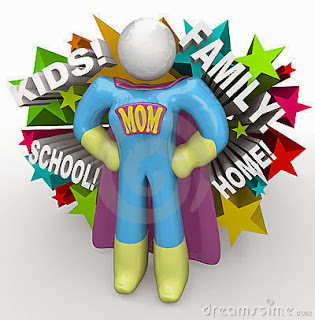 To my girls, I am supermom. I am the #1 mom. They tell me that all the time. I just haven't been listening. Know what - you are super to your children as well. Let's focus on that instead of the mistakes. Let's take time to celebrate our successes each day instead of our failings. Let's find our balance. Let's be happy with who we are. We are good enough. In fact, we are actually pretty darn spectacular! If we weren't we couldn't care about all this "stuff" so much. Thank you Trisha. In my heart I know it won't be easy but I do have to make changes so that I can be happy, healthy and the best me for myself and my family. It's so easy for us moms to put ourselves last. 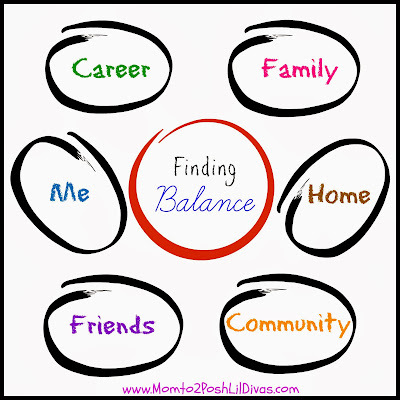 I think finding a balance is a great goal! You are pretty darn spectacular! Love your post. I think finding balance as a mom is the most difficult thing on the planet. It's hard to say no, and it's exhausting to do everything we think we should be doing. I think the best thing I did was take about 10 days off from blogging around the holidays. My traffic suffered for it but I was so tired and burnt out. I feel reenergized now but when I see all the My Top 10 Posts of Last Year, I still felt a little like ... I should have done that like I did in years past. It's hard to find that balance. Ah, we end up putting so much pressure on ourselves, don't we? I'm not making any promises or schedules regarding blogging but I know that it is something I enjoy and want to make time for because I've missed doing it. I think not having any deadlines or pressure is key though. If I don't put out a post this week, it's ok. I had a hard time with that before. I won't have stellar stats but this is where I am right now and I need to embrace it. Key thing is not to compare ourselves - which is soooooooo hard!!! Great post, Bern! Striking a balance, accepting that life is not perfect, figuring out what works for you, and making peace with all of that is key. Like you, I have worked at trying to figure these same things out for myself. I have really backed off from social media, and although I miss being as active as I used to be, my time has been spent focusing on my family as well as my health. It's an adjustment but it is what is working for me at the present. I feel like you were speaking for me when I was reading this. I am on the quest for balance too and slowly, slowly, very slowly, realizing that it's okay for me to be less than perfect, for me to say "no", for me to delegate, and (gulp), even ask for help. I hope you are able to find your balance in this new year. Oh and breakfast for supper is a regular occurrence around here. You are one of the most dedicated mothers, friend and teachers I know. Continue to work on finding balance and life will get "easier" or "better". Remember, your girls love you for who you are, as do your husband, parents, brother and friends! Keep being the wonderful person you are - just let go of some things to be able to have fun while you're at it! I know exactly what you mean. It has been the same way with my blog...throw in going back to school and my blog all but came to a halt at the end of 2013, but I am gearing up to return to blogging this year. You have shared sooo many wonderful experiments and ideas that I've used in our home school and my girls have truly benefited immensely from your site!!!!!!!!! Thanks a bunch and happy new year!! !